Humanity’s next gold rush could take place aboard small probes jetting between asteroids in outer space. Several private and publically funded companies are vying to be the first to mine space rocks for precious resources, including Nasa. The celestial objects are thought to be loaded with tonnes of precious metals and minerals, including pricey platinum, worth quadrillions on Earth. Nasa estimates the total value of resources locked in asteroids is equivalent to $100 billion (£75 billion) for each person on Earth. One private company looking to tap into these orbiting minerals is the US firm Deep Space Industries, which plans to power its spacecraft with steam-powered thrusters. The firm says it will launch its first mining probe in the early 2020s, and antitipates that, by 2030, the market for asteroidal minerals will top £1.1 billion ($1.5 billion). In a new interview, a technology expert at Deep Space Industries said he envisions swarms of small mining craft flying out to draw resources from near-Earth asteroids. Grant Bonin, chief technology officer at the company, which is based in San Jose, California, said the probes would operate from a central depot in space. ‘It is like honey bees going out to a lot of different flowers and flying that back to the hive,’ he told the Guardian. The depot, positioned somewhere between the moon and Earth, would allow spacecraft to fly out to asteroids as they quickly pass by our planet. It would act as a spot to store resources which could then be sold to governments or private companies. This could be platinum, iron, nickel, gold or even water-derived hydrogen or oxygen fuel. ‘To some extent we are agnostic about what the first market will be,’ Mr Bonin said. Deep Space Industries (DSI) intends to launch a fleet of unmanned ships to intercept small asteroids as they speed past our planet. The firm’s propulsion system uses water vapour heated to 1,000°C (1,832°F) to produce thrust. It has already sold 40 of these boosters to other space companies. ‘Deep Space Industries is an asteroid mining company, developing the technologies to find, harvest, and supply the asteroid resources that will transform the space economy,’ the firm’s website reads. Chief executive David Gump, who produced the first ever TV commercial shot on the International Space Station, said: ‘Using resources harvested in space is the only way to afford permanent space development. ‘More than 900 new asteroids that pass near Earth are discovered every year. ‘They can be like the Iron Range of Minnesota was for the Detroit car industry last century – a key resource located near where it was needed. DSI is one of a number of companies with visions of a mining industry beyond Earth’s orbit. Bankers from Goldman Sachs hope to build an ‘asteroid-grabbing spacecraft’ to make billions from mining space metals. A 98-page report from the banking investment company claimed last year that mining asteroids for precious metals in the near future is a ‘realistic’ goal. ‘Prospecting probes can likely be built for tens of millions of dollars each and Caltech has suggested an asteroid-grabbing spacecraft could cost $2.6bn,’ the report said. Even the UK has entered the race with the Preston-based Asteroid Mining Corporation, run by 23-year-old space entrepeneur Mitch Hunter-Scullion. 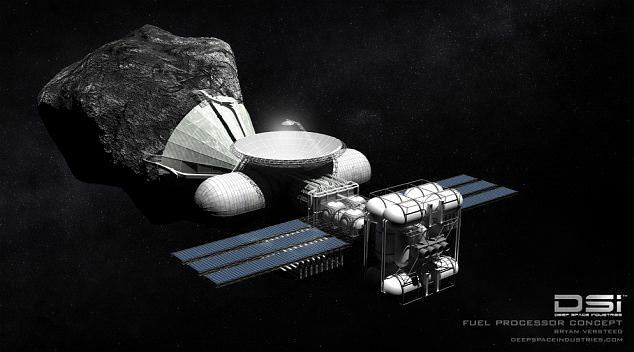 The graduate plans to build a satellite that can land on asteroids and extract minerals, eventually expanding the operation to include a mining space station. Asteroids are made of carbon, silicon or metal, but it is the metallic asteroids that mining companies are most interested in. The compositions of these asteroids are still poorly understood as most research into space rocks is focussed on threats to our planet posed by collisions. No asteroid has yet been directly sampled, but Nasa aims to change that with its plans to send a probe to the mineral-rich asteroid 16 Psyche. 16 Psyche is located in the large asteroid belt between Mars and Jupiter and is one of the most mysterious objects in the solar system. It may have started as a planet before it was partially destroyed during the formation of our star system. Nasa announced in January 2017 that it intended to send a probe to the asteroid to sample its chemical makeup in 2022. In comparison, all the money on Earth is thought to be worth $60 to $75 trillion. Experts have warned that its value would be large enough to destroy commodity prices and cause the world’s economy to collapse.